The mission of the Sheridan Police Department is to preserve the peace and enhance the quality of life through commitment and community partnership. 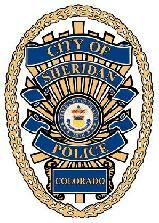 The Sheridan Police Department is a professional police agency with a continuing excellence in providing innovative and equitable police services. The values the Sheridan Police Department strive for include, but are not limited to, leadership, professionalism, respect, integrity, accountability, and community partnerships. These goals are strategies that Sheridan officers will work under to create and enhance relationships and partnerships within the community. For more information, contact Administrative Manager Santo Realmuto at 303-762-2234.